In the right atmosphere, dough quietly begins to rise. Eventually, it becomes recognizable as bread. As a young child in my grandmother’s kitchen, I found this process magical. As a young adolescent, I discovered the even more magical delights of fermentation. The purpose of this article is to present an overall transactional analysis model of psychopathology in children and adolescents and a framework for rapid treatment planning. 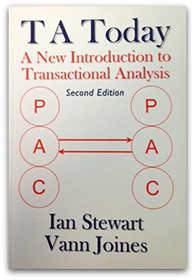 A number of authors have presented a variety of transactional analysis treatment methods, but these techniques have not really been synthesized into a larger, encompassing framework. It is the aim of this article to do so. At age 3, Marie did not differentiate between people. She called no one by name and went to everyone indiscriminately. When thwarted, she went into rages that lasted for hours. During these periods she destroyed homes and injured herself and adults, hitting, kicking, punching, pulling hair, and urinating on people. Her three-year life history was tragic. After removal from her schizophrenic mother’s home because of neglect and abuse, she had been ejected from nine different foster homes, leaving a series of foster mothers partially bald. In some of these homes she had been sexually abused. In the first year of inpatient and daytreatment therapy, she went through a number of stages. She began to distinguish one person from the others and then to call him by name. A little later, she started to carry around his photograph. This seemed to give her some comfort when he was not present. When she had a temper tantrum, however, she would threaten to tear it up. Gradually, she began actively to try to please him and two others, including her foster mother at the time. She asked us to send notes home to the latter when she behaved well for even part of a day. Then, she began to talk of absent people as nurturant and began to be helpful to other children. Three months later, she tried to get her foster mother to “get rid of this bad little girl” by raging almost constantly for two days, but the foster mother held firm. With each new stage, the intensity and frequency of her aggressive, destructive behaviors lessened. This free 59-page E-booklet addresses anger, grief, depression, responsibility, and personal change. This e-booklet is a great summary of TA ideas and how you can apply them toward your own personal transformation. It also has great information for practitioners! To learn more about TA and to join USATAA, click the link below. In this article the most important TA concepts will be described in such a way that they do not automatically convey the ideas and attitudes of professional psychotherapists or even mere psychological descriptions of reality. Most of the methods of thinking or action familiar from classical TA have been retained, but are formulated in such a way that they can be specified in various areas of Society by varying professionals according to their respective roles and contexts. The concept of role used here does not coincide with its common meaning in sociology and social psychology (e.g. Popitz, 1967). Roles are partially a question of social Standards in the sense of social patterns of expectation, but nevertheless role experience, role behavior and role relationships of people are seen as the individual’s task of creating. Understanding how to deal with roles in our Society is considered essential for Professional encounters and professionalisation. l will first describe the concepts from the perspective of the individual. Then l will follow the concepts from the perspective of relationships. 1. Schmid, B., (1984). Theory, Language and Intuition. In: TA – The State of the Art – a European Contribution, Erika Stern (ed.). Foris-Publications, Dordrecht/Holland – Cinnaminson/USA, p.61-65. 2. Schmid, B. and Jager, K., (1984). ‘Breaking through the Dilemma-Circle”. In: TA – The State of the Art a European Contribution, Erika Stern (ed. )Foris-Publications, Dordrecht/Holland – Cinnaminson/ USA, p. 107-118. 5. Schmid, B., (1989). Acceptance Speech: Een concept om met theorie en identiteit in de T.A. – gemeenschap om te gaan. In: Strook, Tydschrift voor Transactionele Analyse 2, p.49-58. Englische version as paper for the speech on EATA assembly. 6. Schmid, B., (1991). Intuition of the Possible and Transactional Creations of Reality. In: Transactional Analysis Journal 3, p. 144-154. 7. Schmid, B. (1994) Transactional Analysis and Social Roles. The Maastricht Papers, Selection from the 20th EATA Conference. 10.-14. July 1994. Maastricht, the Netherlands, S. 30-44. I thank the EATA bodies very much for the honor to get the first EATA Award 1988. I share this honor with Klaus Jäger, an organizational member of EATA, who helped me to write down my ideas about dilemma dynamics and approaches to treat them. I also welcome the invitation to this EATA conference and the 1.000 Sfrs, which go along with the prize. The money will be spent to GREENPEACE to support this organization in its most important contribution to the survival of us all. I hope that you and me will find ways to cultivate the garden, which our children and we want to live in and to enjoy. I am grateful that I have the opportunity today to talk to you about some of my ideas concerning the development of TA. Chris gets through a lot of work, by doing everything very quickly. Chris moves fast, thinks fast, talks fast, and seems to do everything so much more quickly than most people. However, every so often Chris makes a mistake through rushing so much – and then it takes twice as long to put it right – especially as Chris seems intent on finding a shortcut instead of taking time to work it through again. Chris also has a bad habit of arriving late at meetings, and of needing to leave early to get to the next meeting! And during the meeting Chris is quite likely to be openly impatient and interrupt a lot, so that people feel pressured and hurried. Pt: (After a long pause) I guess I’m sorta… I don’t know…. depressed. I guess. Ther: But you’re not sure? Pt: Yeah, I’m…. I guess… I’m depressed all right. Ther: Did you know that when you came in, or did you just figure that out? Pt: I guess I knew it when I came in… sorta, anyway. Ther: But you said you didn’t know. I’m puzzled. Ther: (interrupting) Is this about your depression? Ther: (interrupting) We can come back to that in a few minutes. I’m feeling unfinished about what we started with. Ther: When you said you didn’t know what was the matter with you, but then later you said you did know. I said I was puzzled by that. Pt: I don’t know what you mean (half-smile, looks down, then back up). Ther: (Thinks “Now I have to make a choice, to stay with the earlier confusion or this second instance, because he certainly does know what I mean. The pattern is he professes to be confused when he really for some reason doesn’t want to connect directly. I’ll stay with the current instance because it’s the same issue but maybe a little clearer…”) (smiling) Why do you say you don’t know what I mean when in fact you do? Seems to be almost habitual. Pt: It gives me time to think, I guess. Yeah, I guess that’s it. Ther: (Thinks “He never says things straight out, but always with the ‘I guess’ or ‘soda’… I wonder if that’s part of the same mechanism”) Does it seem to you that you’re under time pressure to answer me? (before client can reply, therapist continues:) Take all the time you want (grins). Ther: (interrupts, says with emphasis:) No, take all the time you want. Pt: What? Oh. I’m.. I guess I I don’t know why I do that. Ther: I don’t agree with you. You do that so consistently, in such an organized way, that I’m convinced there is a specific purpose behind your behavior, even if it’s not easy to put into words. Pt: I guess I’ve always done that. Ther: (Thinks “At least he acknowledges what he’s doing. A step in the right direction ) (Half-way through a session. 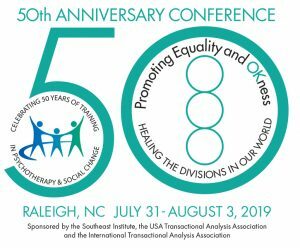 USATAA is the organization of professionals and other interested persons living in the United States of America who subscribe to the theory and practice of Transactional Analysis. Those who live outside of the USA may join as non-voting Associate Members. USATAA is governed by a Coordinating Council consisting of five General Members elected by the membership, with participation of the Advisory Board, consisting of Regional Representatives serving six geographical regions. Both General Members and Regional Representatives serve staggered three-year terms. The Coordinating Council allocates organizational duties among Council members. Currently, the functions are General Coordinator, Coordinator of Communications, Coordinator of Finance, Coordinator of Education, and Coordinator of Programs. Additional non-voting ad hoc members may be appointed by the Council on an annual basis to provide assistance and advice. The immediate past General Coordinator serves as an ad-hoc member for a three-year period following his or her term in office. USATAA is a grassroots organization which encourages local and regional groups to convene and to propose priorities and activities. For example, the Eastern Regional TA Association is an affiliate of USATAA and the Southwest Region has formed a group called the Southwest Transformers, which holds an annual Southwest Gathering as well as other programs. Members who wish to participate in committees, activities, or decision-making are invited to contact any of the council members or your regional representative. Your voice will be heard.